Go See This Movie Next Weekend: CLU Graduate Writes a Major Motion Picture! How to Hear God's Voice Streaming Video is Now Available! Tent-Making Activity More Stamina Than Ever! The Key is DOING What We Have Been Taught! THEN it WORKS!!! Please support this film by going to see it during its opening weekend if possible, and send a message to Fox Faith that we want more family films like this one. In 2006 we completed taping the full "How to Hear God's Voice" 10-hour course at TACF. This teaching is finally available via on-demand, streaming online video. Save 70% off the price of the DVD series! Save 100% of the shipping cost, which can be substantial, especially on international orders. Start watching your videos much sooner! You normally receive the video access link on the next business day. View this teaching anywhere you have internet access: home, the office, a friend or relative's house, wireless access "hotspots", etc. There's no need to carry the DVDs around with you! Choose the video quality that best fits your internet connection speed: from 56k dial-up, all the way to broadband cable. Click here to purchase now for only $20! Course of the Month: Through the Bible Series Januarys special extended! New online quizzes. Think you know your Bible backwards and forwards? Take these fun online tests to see if youre right! And if you dont do as well as you thought you would, then just maybe you should take advantage of this extended offer! Is one of your New Years resolutions to read through the entire Bible this year? Has it been a resolution in years past that fell by the wayside sometime around April? Perhaps it is time to try a different approach. Rather than simply reading through the Bible, wouldnt it be great to slow down a little and finally get a handle on all those kings and judges and prophets, and how the history of Israel all fits together, and why we should even care about it? The Through the Bible series of eight courses with CLU can help you do just that. Why not make these courses the foundation of your daily devotions for the next two years? You may choose any of the eight courses. Enroll during the month of March 2007 and you can request a 25% discount off the cost of books and tuition for as many Through the Bible classes that you order. (Students already receiving a financial aid discount can request a 10% discount.) There is no better investment of your time or money that you could ever make than investing in greater knowledge and understanding of the Word of God! Tent-Making Activity (Acts 18:1-4) More Stamina Than Ever! Following is Mark Virkler's personal story, written last Fall. I have now been taking this superfood for 10 weeks and I just accomplished something I never thought I would do again. I have taught 8-hour seminars on hearing Gods voice for the last 25 years of my life. They are Friday evening and Saturday 9:00 5:00. I have found in recent years that I am really exhausted on Saturday evening after teaching these 8-hour seminars. Well, this last week, Thursday through Saturday, I taught two of these 8-hour seminars back-to-back in Canada. The first one was Thursday all day 9:30 in the morning 9:30 in the evening and then Friday 9:30 in the morning till 5:00 in the evening (extra long as I was working through a Chinese translator). In addition on Thursday I drove 3 hours before I began teaching at 9:30 in the morning. Then I drove Friday evening from 5:00 to 7:00 to a second location and taught from 7:00 10:00 and then on Saturday from 9:00 5:00 and then drove 3 hours home. When I arrived home on Saturday evening I was still not exhausted. I had taken a bottle of the juice with me and drank it throughout the seminars. For me this is a miracle. I have much more stamina than I have had in recent years. I am feeling better the longer I drink the juice. This is truly exciting. I am experiencing the aging process reverse in my body. Could you use more energy? Has your stamina been slowly diminishing, and you wish there was something you could do to regain your youthfulness? What are you waiting for? Click here to learn more and try this delicious superfood for three months completely risk-free, and see what it does for you. After taking your course a couple of years ago at Our Saviors Lutheran Church in Colonie (Albany), NY, I finally got into an accountability relationship with two other men and started actually doing what you taught. It is making a big difference in my life! Thank you for being faithful to carry this message to so many. This Fall I taught a two-part summary of your main points to the Student Christian Association here at Hudson Valley Community College. It was so well received! I got reports back the following week from 3 or 4 students and one faculty member who had already put the principles into practice and were experiencing blessed results of increased intimacy and guidance! Last night I did the first of the same two parts at the Intervarsity Christian Fellowship group Union College in Schenectady. The reception was great! One student wanted a copy of the example I read of one of my own conversations with God. He knew someone who would really benefit from reading it. Wow! And after I was done, one of the volunteer staff told me she had your big manual and had taken the full course through a small group and was thrilled with its effect on her life. 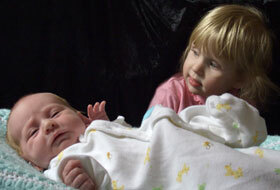 Rebekah Jane was born to Joshua and Charlene Virkler February 5, 2007, joining big sister, Jasmine (21 months). She weighed 7 pounds at birth, a big surprise after their 10 pound, 11-ounce firstborn. She is sweet and easy-going, not bothered by much of anything. We are very thankful for her, and Mark and Patti love having another grandchild to dote over! Special thanks to Philip Chandane who has translated the tract, You Can Hear Gods Voice into Marathi.